Global senior business executive involved with multinational financial institutions and families in Europe, Central Asia, China, Latin America Middle East and the US. Three decades of experience around the world in various roles as global managing partner of Andersen and subsequently Ernst and Young, he became involved in private equity in 2004 and has co-founded since then various businesses. In 2006 in particular, Nobert Becker founded ATOZ an international tax advisory firm and the Compagnie de Banque Privée (CBP), specialized in private banking services. In 2011, CBP and the Quilvest Group have merged their Wealth Management activities to create Quilvest Wealth Management (QWM). Since then CBP changed its name to Compagnie de Banque Privée Quilvest (CBP Quilvest). Nowadays Norbert Becker is the Chairman of the Board of directors of CBP Quilvest. 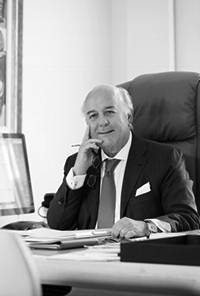 Norbert Becker also became involved as an independent director (non-executive) with several prestigious institutions. Norbert lives in Luxembourg and Paris. He has interests in vineyards in Bordeaux, Burgundy and Mendozza in Argentina. In 2015. He is member of the “Academy des Gastronomes” in Paris.